BIG BOOST—Karen Simeri, left, principal of Grace Brethren Elementary School in Simi Valley, Calif., poses with students Meghan Macaya, Makayla Walia and Marcus Hernandez and the school’s executive director, Ray Blackwell, during a special check presentation Jan. 26. 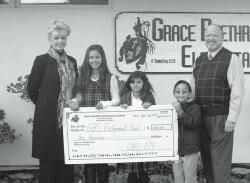 Ray Blackwell, executive director of Grace Brethren Schools in Simi Valley, received a $1,000 donation last week for the school’s endowment fund from the Parent Teacher Fellowship of Grace Brethren Elementary. The elementary school students raised $19,707 through a magazine sale fundraiser that began at the start of school in September. The PTF decided to give $1,000 of that money to the endowment. The purpose of the endowment is to assist parents with tuition, continue education for teachers and upgrade and maintain the campus. Grace Brethren Elementary will have a community open house today, Feb. 5 from 9 a.m. to 2 p.m. at the school, 1717 Arcane St., Simi Valley. Grace Brethren Elementary is a private Christian school for students in kindergarten through sixth grade, affiliated with the Grace Brethren Church of Simi Valley, John McIntosh, pastor.